Title: Scandia sive Regiones Septentrionales. Publication: Geographiae universae tum veteris, tum novae absolutissimum opus... Auctore eodem Io. Anto. Magino Patavino..., Cologne 1597, Petrus Keschedt. 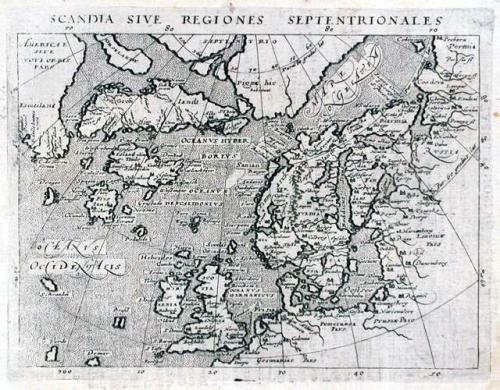 An interesting map of Scandinavia and the North Atlantic. Of special note is the depiction of part of the east coast of North America (Labrador? / Newfoundland?). The sea is filled with numerous fictitious islands such as Frisland, St. Brendan, Brasil and Demar. Text on verso.